A contract worker scoops up oil that washed ashore Wednesday on a public beach in Dauphin Island, Alabama. Photo by Win McNamee/Getty Images. Updated 3:00 p.m. ET | The Interior Department says that it has not extended its moratorium on new oil drilling in the Gulf of Mexico to shallow waters, contradicting earlier news reports, according to the Washington Post and the Associated Press. “Shallow water drilling may continue as long as oil and gas operations satisfy the environmental and safety requirements Secretary Salazar outlined in his report to the President and have exploration plans that meet those requirements. There is no moratorium on shallow water drilling,” an Interior Department spokesman said. Updated 2:35 p.m. ET | BP CEO Tony Hayward told reporters Thursday afternoon that the company should know in the next 12 to 24 hours whether its latest attempt to contain the Gulf of Mexico oil leak is working. He also acknowledged that the procedure — a containment cap intended to funnel most of the oil to a tanker on the surface — is risky. The first step of cutting off the top of the riser pipe, which was completed this morning, could temporarily increase the flow of oil from the pipe up to 20 percent. Meanwhile, the Obama Administration has stopped issuing permits for offshore drilling — at any depth — in the Gulf, according to the Washington Post and the Associated Press. Michael J. Saucier, regional supervisor of field operations for the Minerals Management Service Gulf of Mexico region, said in an e-mail to one company that “until further notice we have been informed not to approve or allow any drilling not matter the water depth,” the Post reported. Three days earlier the company had been told that drilling in water up to 500 feet deep would not be affected by the administration’s moratorium on new deep water drilling. Updated at 10:55 a.m. ET | Coast Guard Adm. Thad Allen said BP has successfully cut through the blown-out pipe spewing oil into the Gulf of Mexico. The company’s next step will be to connect a cap to the pipe in hopes of siphoning oil to the surface. 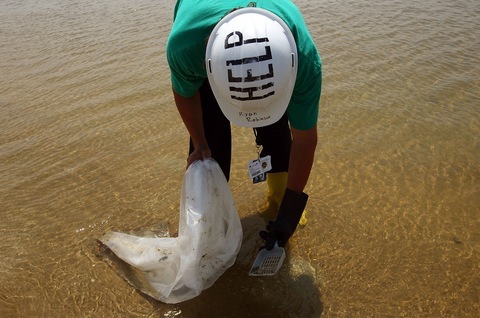 BP will start lowering the cap into the water over the next several hours, according to Allen. However, because the cut was irregular, connecting the cap will be more of a challenge. As BP’s efforts to contain the worst oil spill in U.S. history suffered another setback on Wednesday, the company’s CEO admitted that the British petroleum giant was not fully prepared for a deep-water spill. “What is undoubtedly true is that we did not have the tools you would want in your tool-kit,” CEO Tony Hayward told the Financial Times from Houston. Hayward added that it was “entirely fair” to criticize the company for its response. BP had to dig back into its tool kit on Wednesday after the diamond-tipped saw it was using to slice through the blown-out well in the Gulf of Mexico became stuck. BP eventually freed the saw, and will next attempt to cut the pipe by using what amounts to a giant pair of scissors. Hundreds of pro-Palestinian activists detained by Israeli forces during a controversial raid on a humanitarian flotilla have returned to Turkey, where they were welcomed by the country’s prime minister on Thursday. The bodies of nine people killed by Israeli commandos during Monday’s raid also returned. Turkish investigators say that one of the nine killed was an American citizen of Turkish decent, a development that “added a new diplomatic complexity as Israel struggled to defuse rising international anger over its raid,” reports the New York Times. Israel has rejected calls from the United Nations for an international investigation into the raid, saying its military is already conducting an internal inquiry into the incident. President Barack Obama will meet with Arizona Gov. Jan Brewer on Thursday for the first time since she signed a hotly debated immigration law in April. President Obama has called the law “misdirected” and instructed the Justice Department to examine whether the measure to see if it violates federal civil rights statutes. The law requires police to question anyone suspected of being in the country illegally about their immigration status. Speaking on CNN this week, Brewer said she is not worried about a potential legal challenge from the Obama administration. “We’ll meet you in court,” Brewer said. In a promising sign ahead of Friday’s unemployment report, private-sector jobs increased by 55,000 in May, the fourth straight month of increases, according to a survey by the payroll giant ADP. Also on Thursday, the Labor Department reported that initial claims for jobless benefits fell by 10,000 to 453,000 in the week ended May 29.